The Certified Program in the Far West Division is administered by the Association of Professional Patroller (APP). All testing areas above other than the Skiing Test have written test to pass at an 80% level before you can take the practical test. These tests are from 15 to 20 questions in length. The tests look for general and specialized knowledge within each area. The aim of the written test is to weed out those that don’t come prepared to take the practical tests. The questions are True/False; Multiple Choice; and Short Answer. All the practical tests range from 45 minutes to an hour and a half in length. Oral demonstration exists in all testing areas with the exception of the Ski Test. Risk Management and Explosives are oral tests. All others require skill demonstration as well as oral presentation. Go to http://www.propatrollers.org and become familiar with the Calendar for APP Winter Clinics and the APP Spring Clinic. This will give you a time goal to get prepared. Mid-Winter Clinics are two day clinics usually mid-week. There are usually two clinics in California (Lake Tahoe/Central Sierras and Southern California), one the Pacific Northwest, one in the Southwest, and one in Idaho. Study the Criteria for each discipline. The Criteria discusses what it takes to become Associate Certified and Certified. Look in APP Certification Program for information for all nine Testing areas. Buy a Study Guide. This is a dynamic guide that is being expanded continually by Head and Assistant Judges for each Testing Area. The current cost is $35.00 and copies can be purchased through the APP President, Scott Hoffman. Look for his contact information on the APP website. Skiing at host resorts for Mid-Winter Clinics (2 days) and the Spring Clinic (5 days) for $10.00 or less/ day. You can join the APP as a sustaining member just to get this opportunity. Association and Networking with Patrollers throughout the West: California, Nevada Oregon, Washington, Idaho, Arizona, and New Mexico. Training is available in all Testing areas. An excellent Risk Management Forum was presented at Squaw Valley last spring. Access to demo skiing equipment and outdoor products brought to you by partners/ sponsors of the APP. Training Clinics put on by Head and Assistant Judges at Mid-Winter and Spring Clinics. Not all disciplines are presented. If you have a specific need or desire, ask and opportunities will be made available. If there is an OPEN testing slot for a Testing Area. A “one on one” training clinic can be made available for future testing candidates. Audit a test. With the permission of the judge and the candidate you can audit a test as long as you don’t interfere with the flow of the test and you don’t plan on testing in that discipline at the same clinic. Start your testing in areas that are already your strength. Most of us as Patrollers ski everyday that we Patrol. We are commonly exposed to prevention opportunities with mountain opening responsibilities. When injuries occur First Aid and Loss Control are skills we need to have. Consider a progression with Testing that starts with Skiing; Hill Safety; Medical; and First Aid. Get a feel for testing and confidence from testing by pursing your strengths and the things you do most first. Find a “Mentor”. Seek out someone at your resort that has gone through the Certification Program of the APP. You will need training and time to study on your own. The Testing areas are very comprehensive. Seek out your ski areas Ski or Snowsports School. The Professional Ski Instructors of American (PSIA) and the American Association of Snowboard Instructors (AASI) are available to all of us to improve our skills. Get over, if you haven’t already, the rivalry between Patrol and Ski School. 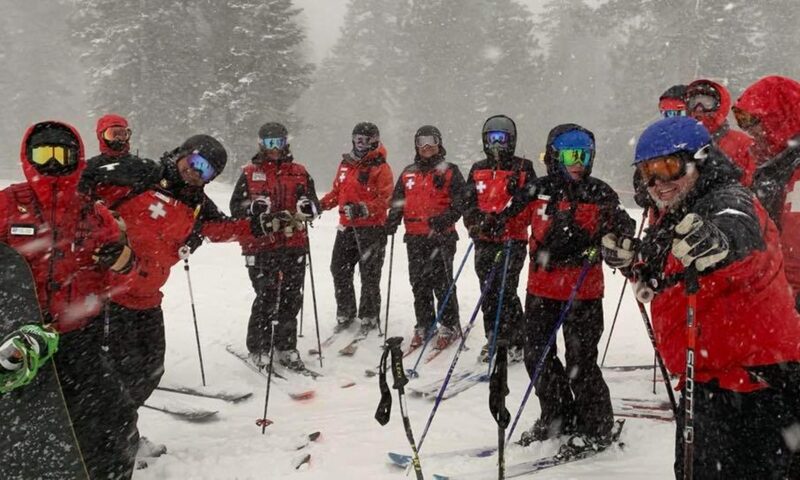 References: The National Ski Patrol website (www.nsp.org) under Member Services then Catalog and Supplies has a catalog section with many PSIA and AASI publications. Expect to be answering questions while riding lifts and observing mountain terrain. Become an Outdoor Emergency Toboggan (OET) Instructor after becoming a Senior with your Patrol. Find a partner to practice and test with. You need to become one as a handler and a tail rope person and vice versa. Most difficulties that candidates have with the Sled test are that they don’t come with a partner that they have practiced with. This is an Oral Test generally given indoors or outside in the base area or a ski resort. Seek out your ski area Risk Manager. You will need to become familiar with prevention programs for employees and guest alike. Occupational Safety and Health Administration (OSHA) laws and policies related to ski area management are very important to understand. References: Look on the internet for information on OSHA; National Ski Areas Association (NSAA); Skier Safety; and Ski Industry Inherent Risk Laws for your State. Seek out a Lift Maintenance Technician at your ski area. You will need a fairly comprehensive understanding of lifts (signage, heights, operation, electric motors, auxiliary power units, braking systems, fail safes, and tower, carrier, and haul rope features). Your ski area’s Marking Policy, Lift Evacuation, Search and Rescue Plans, and Terrain Park Operations are important to know. References: National Ski Patrol: The Lift Evacuation Manual; American National Standards Institute’s (ANSI) latest manual for lift operations (B77.1). Ski area policies and procedures as stated before. The Criteria on the APP website is a great study guide. Score sheets are given for Emergency Medical Technician National Registry – Cardiac, Medical, and Trauma Assessments. Use these to get prepared. Be able to perform a full Patient Assessment; deal with STAT situations that are life and limb threatening; assess Risk Management issues; briefly train rookie Patrollers to help you; and lead the scene like an Incident Commander ALL while talking about what you doing throughout. It takes lots of practice to “talk and chew gum” in this area. Expect to be answering questions while riding or sitting on a lift and observing mountain terrain. You must be able to perform these skills while taking and tying knots. If you work at a ski area without an Avalanche Control Program look for an opportunity to make arrangements to go to a mountain who has one. There are many areas that are friendly for this. By law you cannot handle explosives as a Volunteer but there are many ways for you to be exposed to the process. The goal would be to recognize avalanche terrain and understand the mitigation processes. Buy a Transceiver and use it frequently. This is a serious test. Your buddy would expect that you could rescue them and vice versa. Set up a course frequently and work through it. Encourage others on your Patrol to do the same. Help them as they help you. References: The same as Avalanche Control plus The National Ski Patrol’s Avalanche Rescue Fundamentals book. Your local ski area’s Avalanche Rescue Plan. The Instruction/Owner’s Manual for your transceiver and other models. Use the internet. You will need to have some general knowledge of other transceivers and search techniques. As with Avalanche Control if your ski area does not have an Explosives Program seek out a ski area that does. References: BATF&E Explosives Law and Regulations (76 pages), International Society of Explosives Engineers (ISSEE) Blaster’s Handbook. Use the internet to gain information from BATF&E, OSHA (Specifically the General Industry Safety Orders – GISO, see also the APP website for APP Endorses Proposed Avalanche Blasting Amendments), American Avalanche Association (AAA), and Explosives Manufacturers. The Study Guide for the APP has a great section on Explosives completed by the current Head Judge for Explosives, Scott Williams from Steven’s Pass in Washington. Before you test in any category you will need to get your Paid Patrol Director’s sign off. He or she will confirm that you are prepared and capable of testing in a particular area. You will need to pass the written before taking the practical test. You cannot take the same written test twice at the same clinic because you did not pass it the first time. You will be tested on your local ski area policies, procedures, and protocol. No negative assessment will be made as long as you know your local programs and they don’t put you in an unsafe situation. Have general knowledge in each discipline beyond local programs that are considered ski industry standards. Know laws federal, state, and county that effect ski area management. Come prepared. There is no substitute for practice through repetition. One of the best examples is: Don’t expect to certify after practicing only a few times finding two buried transceiver in five minutes. Exceptions can be made if you don’t have some or all of these people. My suggestion is that you bring them. This sets a professional appearance to the judges. You are familiar with these people and this can make a major difference in an initially unfamiliar anxious environment of testing. Come with equipment that you use in training for Testing. You would not come to the Ski test without your skis or snowboard. Below are items to bring (buy or borrow them). Skiing – your own equipment with bindings where appropriate set to your skier type. Sleds- many bring their own toboggans. Most ski areas have Cascade Toboggan Model 100 sleds. You may not find your favorite handle height or 30” or 50” fins, however. Look your judge(s) in the eyes with confidence as you answer and demonstrate your knowledge. With skill demonstration be focused on the discipline that you are performing. Your safety, partner/victims safety, and that of other participants and judges is of paramount importance. Please do not under estimate this. Don’t test yet if you are not there with skills demonstration. You wouldn’t think of getting involved to get hurt or injure others. Running into judges on a Ski Test is not a good thing. Head and Assistant Judges are very good about creating scenarios to prevent candidates who have great study habits from certifying without being able put all their learned knowledge together to work out a problem. In other words cramming and memorizing only will not get you where you will need to for certification. Act like you are instructing when you demonstrate you knowledge and skills. In other words take yourself out the testing mode (almost everyone is nervous and anxious) and become the instructor. This I believe will put you into the right relaxed and confident mindset. As a Certified Patroller through the APP be available at least one day per year to judge others. As a Certified Patroller you continue to help grow our industry and the APP. DON’T use testing as an End BUT a Start. Continue to grow in knowledge and skill and help others do the same. This is the next step after Senior. Please consider growing as a Patroller, seek out Certification, Join the APP and get started. Feel free to get in touch we me through the below contact information.